Quick and Easy Taco Salad on the Go! This is one of our favorite quick and easy meals during the week and it's pretty healthy! Follow directions for taco seasoning on the packet and brown the turkey meat in the pan until cooked all the way through. While still warm, put over the chips and put a handful of the mixture of shredded cheeses on top. Toss in a handful of spinach, a scoop of sour cream and as much salsa as desired and mix. 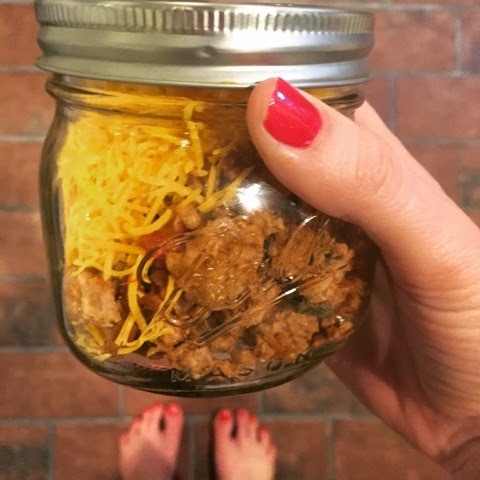 Leftover meat can be stored in a mason jar with cheese. Store chips and spinach in another bag. Microwave the jar (sans lid) and then serve over the chips and spinach (keep those cool otherwise the spinach gets wilty).Top with sour cream and salsa!